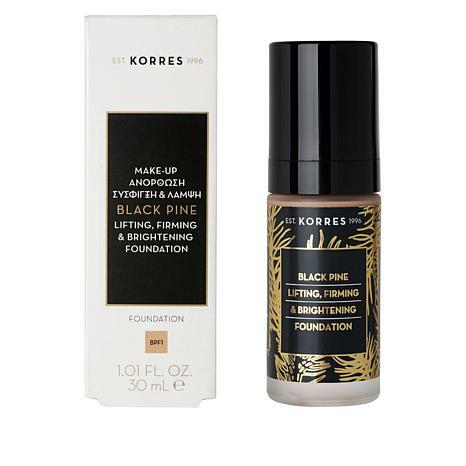 An innovative liquid foundation that delivers key ingredients for temporary firming and brightening benefits, while blending flawlessly for the smoothest skin finish. Dispense a small amount onto the back of your hand and apply to face with sponge or fingertips to achieve an even, natural-looking complexion. Repeat application until desired coverage is achieved. Free of parabens, mineral oil, propylene glycol, ethanolamines, SLES and ALES. Ingredients: AQUA/WATER/EAU, DIMETHICONE, PHENYL TRIMETHICONE, ISODODECANE, CI 77891/TITANIUM DIOXIDE, MYRISTYL TRISILOXANE, VINYL DIMETHICONE/METHICONE SILSESQUIOXANE CROSSPOLYMER, PEG-10 DIMETHICONE, TALC, TRIMETHYLSILOXYSILICATE, CI 77492/IRON OXIDES, CETYL PEG/PPG-10/1 DIMETHICONE, GLYCERIN, BUTYLENE GLYCOL, DISTEARDIMONIUM HECTORITE, PHENOXYETHANOL, SODIUM CHLORIDE, CI 77491/IRON OXIDES, ALCOHOL, CI 77499/IRON OXIDES, CAPRYLIC/CAPRIC TRIGLYCERIDE, POTASSIUM SORBATE, MICA, PARFUM/FRAGRANCE, TOCOPHEROL, ARGANIA SPINOSA KERNEL OIL, EPIGALLOCATECHIN GALLATYL GLUCOSIDE, VITIS VINIFERA (GRAPE) FRUIT EXTRACT, PINUS NIGRA BUD/NEEDLE EXTRACT, PENTAERYTHRITYL TETRA-DI-t-BUTYL HYDROXYHYDROCINNAMATE. This is very lightweight. Goes on smooth and with no brush. Finally a forever foundation! 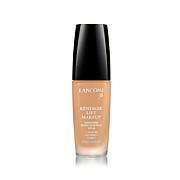 Love the color, creamy lightweight formulation, does not cake or settle into wrinkles and also long wearing. What else could you ask for in an everyday foundation. Extremely happy with the product. This is a product that works exactly as it was described. It instantly made my skin look healthier and younger. Friends are always asking what I have done to improve my skin. Honestly nothing different but purchasing and using this now for about a month. I do hope this foundation is NEVER discontinued. 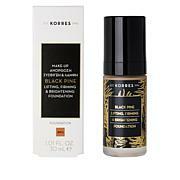 It glides on like nothing I have ever used before, and the coverage is perfect whether you are applying it for a lighter look or heavier coverage. I do not even have to use a brush to apply. Liked the way it went on, stayed on. Don't need much. Wished I would have ordered the Light. Had to return. Wished HSN would allow a one time exchange. Oh, I ordered the Light/Med. Thank you Korres and HSN. I really like this product, goes on smooth and the coverage is great. I like a full coverage, I have used Too Faced foundation before trying this new product & both are great. Steeped in Greek tradition, the Korres line is for the woman who feels good about using skin and body items that contain naturally derived, top-quality ingredients. From rich and decadent body butters to refreshing cleansing face masks, every Korres product contains quality plant extracts and essential oils without added silicone or mineral oil. Remind me about Korres upcoming shows. 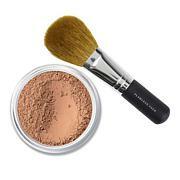 Jay Manuel Beauty® Powder to Cream Foundation with Kabuki Brush What It Is Foundation that starts as a velvety powder and melts flawlessly into a full-coverage cream makeup upon contact with skin; comes with a double-ended Blend & Buff Kabuki Brush for precision application What You Get .